And this week has been all about business business business. And in some ways, that’s more relaxing. Certainly gives me a nice break from editing text (which you can only do successfully for certain periods of time, then you just have to walk away), though I did spend many hours editing images last night. And so… voila! My business card. FINALLY. That would be the sun through the fields where it is thought Vincent shot himself (and I’m inclined, after the strange way I ended up in that spot, to believe it is true), and a little piece of wheat from that field, that I took home with me from Auvers-sur-Oise. I wanted the card to be personal despite how mass-produced a business card is, so there you go: my handwriting, your field, Vincent. The only way to get my handwriting in yellow on a photograph was to make a print and use a paint pen, for the curious… it demanded several layers. So. 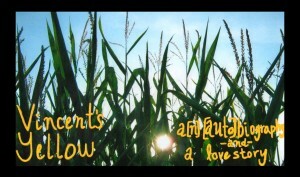 A[n] [auto]biography and a love story. That’s all I really have to say. 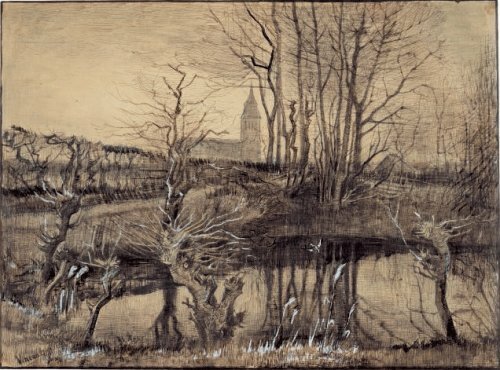 Looking for 3W, 2M: collaborators, performers, dancers, and music-makers, particularly people who can do more than one, for an original work about Vincent van Gogh, love across time and space, and why we all make art in the first place. Directed, produced and written by produced playwright and Off Broadway performer Teresa Veramendi (NYU Drama graduate with a masters in Performance Studies). It’s been three years in the making, come jump in the deep end. Rehearsals begin May 21st, performances July 29th through August. 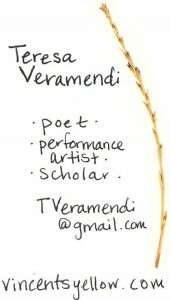 Email me at TVeramendi@gmail.com to schedule an interview. Next up, I’m opening a business checking account, getting Paypal hooked up, and then if you lovely people feel inclined to donate to my art-machine-heart-fire, I’ll make it easy as pie for you (can a silly metaphor cancel out a poetic one? I hope not!) 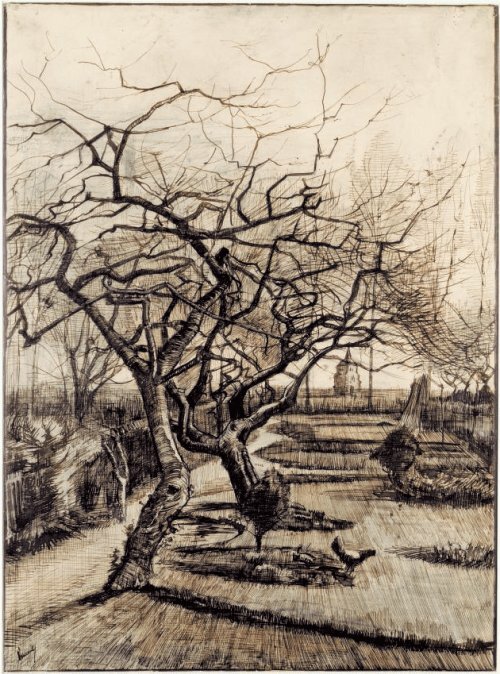 I’m going to try to figure out a way so that for any donation of $20 or more, I’ll send you a Van Gogh postcard with some of my related poetry written on it. I just have to figure out how to keep track of who’s who… I’ll be updating later this week on that, keep an eye out. 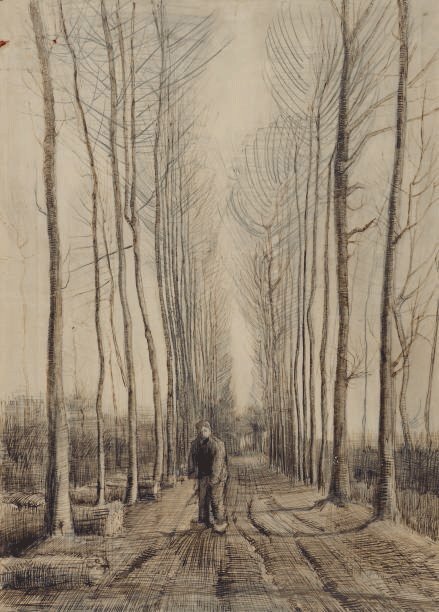 Last but not least, I stumbled upon a series of Vincent’s drawings the other day that took my breath away, so enjoy, my friends. From March 1884. Winter scenes in Nuenen. Pretend you’re drinking tea if you’re not. I always find it wonderfully cosy to sit by a fire in the dusk and to look through the window at a snow-covered landscape.